A 60- second purification solution for raw meat, poultry, and fish. Nature's Marinade was created out of concern for our health and well-being. It was designed to remove parasites and impurities from different raw meats before preparation. The idea was to purify various meats before they made it to your digestive tract and eventually the rest of body. Why put your body through the arduous task of attempting to eliminate parasites, worms, pathogens, and chemicals while trying to create balance and restoration? 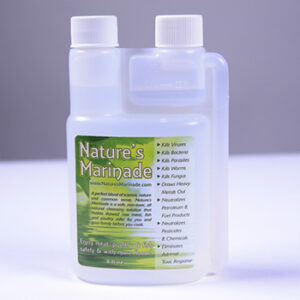 Nature's Marinade has multiple functioning components that become active with the detection of parasites, worms, fungus, viruses, bacteria, and chemicals. Petroleum and fuels are neutralized during the process. Heavy metals, such as mercury and lead are brought to the surface. A toxic adrenal release, which is a natural fear response to the processing of live sources, is also rendered inert. Nature's Marinade is simple to use. It involves a quick mixing of the solution. Then place the raw thawed meat, poultry, or fish into a plastic baggy with the solution. After 60-seconds remove and rinse. Now prepare in your desired fashion and enjoy. Nature's Marinade utilizes a safe nontoxic natural means to enhance a healthier and more invigorating lifestyle while honoring the purity of nature’s elements.